As part of its Education for Sustainable Development programme, Newton College promotes Green Travel. We are very conscious of the air and noise contamination due to the increasing traffic in Lima and so, our general plan is to provide and promote transport for our students that reduces carbon footprints and that saves their parents time and stress. 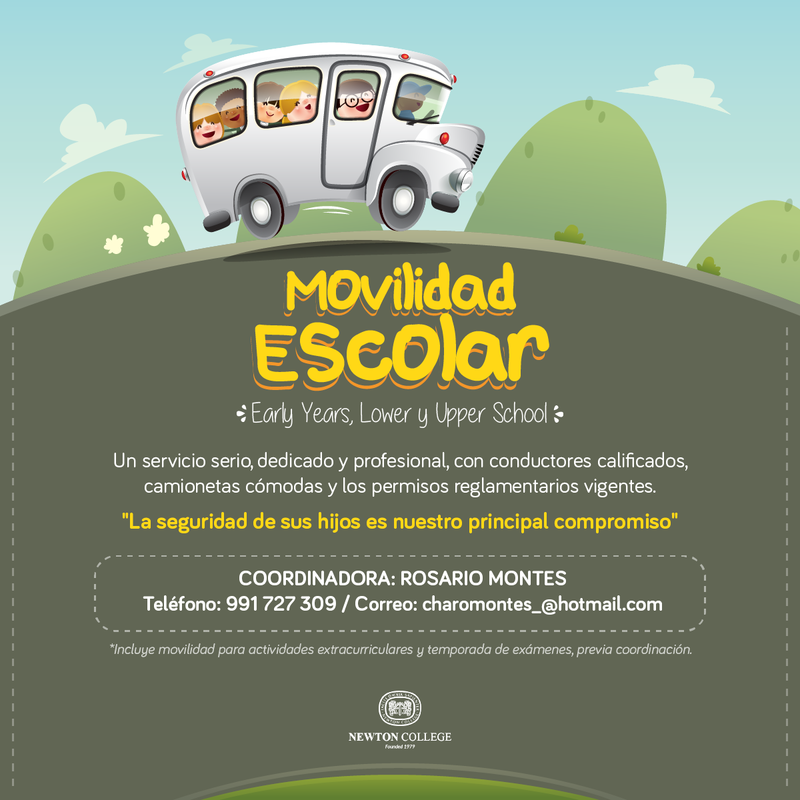 These comfortable 40-seater buses at present pick up children in the morning (only at entrance time) from different fixed locations in La Molina, Surco and San Borja. The buses comply with all security measures and, in addition to the driver, an adult employee accompanies the pupils along the route to school. At present this service is free of cost, but as the school provides more of them parents will probably be asked to pay a nominal cost. The school has authorised a fleet of 16 mini-buses to pick up pupils from their house and return them home at the end of the school day. These mini-buses accommodate between 12 and 16 passengers and comply with very strict security measures. They service in districts such as San Isidro, Miraflores, Barranco, Surco, San Borja and La Molina. You may find further information about schedules, routes and rates here. The school has been promoting car pool for the last few years and we are glad to learn that each year more and more parents are taking up this option. Usually parents who live near to each other will share the driving to and from school of all their children. The school will assist you in getting in contact with other parents who live in your neighbourhood. The school is encouraging the Municipality of La Molina to provide more cycle paths so that students who live not too far away can cycle safely to and from school. We provide cyclists with safe areas where they can leave their bicycles during the school day. Newton College is very committed to Education for Sustainable Development and in addition to transport we focus on reducing our carbon footprint with regard to energy and water, purchasing and waste, food and drink, green areas and architecture.